1 of 6 Stir together sugar, cornstarch and salt in medium-size saucepan until blended. Stir in milk until smooth. Cook, stirring constantly, over medium heat until mixture thickens and boils for 1 minute. 2 of 6 Beat egg yolks slightly in small bowl. Whisk in about half of milk mixture. Stir back into milk mixture in saucepan. Cook, stirring constantly, 1 minute or until mixture thickens slightly. Stir in butter and vanilla. 3 of 6 Transfer mixture to a bowl. Place over ice water. Let stand, stirring frequently, until cold. 4 of 6 Spread about one-third of mixture over bottom of pie shell. 5 of 6 Peel and slice 2 bananas; arrange over top of cream filling. Cover with remaining cream filling, spreading evenly. Place a piece of parchment or waxed paper directly on top of filling. Refrigerate 2 to 3 hours or until chilled and firm. 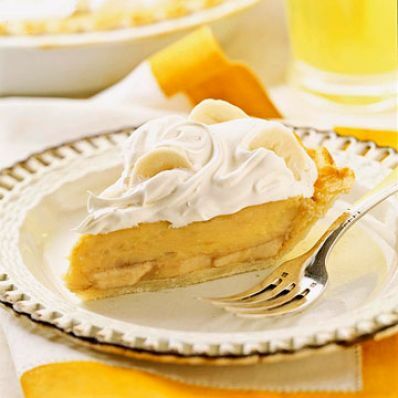 6 of 6 To serve, remove paper and top with whipped cream and remaining banana, sliced. Per Serving: 272 mg sodium, 92 mg chol., 49 g carb., 15 g Fat, total, 339 kcal cal., 5 g pro.